Red Spins Casino will then reward you with a bonus (Welcome Bonus is for new players only). The terms and conditions of the bonuses vary between different casinos and might also change over time and between different countries, so it is important to compare the different offers and read the T&C for Red Spins Casino before signing up. Red Spins is an instant-play casino powered by Nektan, an internationally licensed company that specialises in developing commercial gaming content for land-based operators and brand owners. The site operates under the UK Gambling Commission and the Government of Gibraltar authority, providing games that are tested for fairness by independent testing laboratories. Nektan casinos, including Red Spins, use IBAS as their Alternative Dispute Resolution service and protect their players’ safety via advanced SSL encryption technology which shields the users’ sensitive data. The casino also offers regularly updated payout reports for all of their games which can be found at the bottom of the page, by clicking on the Fair Games. Red Spins is a mobile-friendly site and all of the games can be launched on iOS, Windows, and Android smartphones and tablets. The platform is extremely easy to navigate, enabling the visitors to choose among more than 300 games, divided into multiple categories – Slots, Live Casino, Mobile, Jackpots, Blackjack, Roulette, and Scratch. Additional filters are available for Slots and Mobile categories, allowing the players to select the games according to variance, structure, or provider – Barcrest, Big Time Gaming, Blueprint Gaming, Elk Studios, Evolution Gaming, Pragmatic Play, Microgaming, Nektan, Lightning Box, NetEnt… There is also a brief description for each of the games – to access it, simply click the “i” icon in the corner of the thumbnail image and the info about the developer, RTP, number of paylines, and variance will be displayed. Red Spins casino has a pretty decent assortment of Casino Games, and their players will be able to choose between Live and virtual tables. The latter does not require an activate account and you can launch Blackjack, Roulette, Punto Banco, Oasis Poker, Caribbean Stud, and Texas Holdem in demo-play mode. Medusa, Boss Lotto, Foxin’ Wins, Oil Mania, and Volcano Eruption are stored under the Scratch category, which also introduces an extensive explanation of the scratch game rules. The Scratchcards also have the corresponding slots variants which can be launched directly from the game screen. 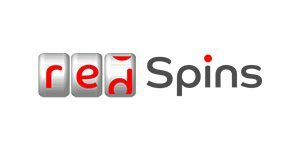 Red Spins casino accepts a number of payment methods, some of which will be limited to the residents of certain territories. With the exception of Boku, there will be no transaction fees and the full amount will be transferred over to your casino cashier. The minimum amount that can be deposited is £10, or £15 if you are using Boku services (with 15% fee on top), and the processing time is instant. Other available methods are Visa, Maestro, MasterCard, PayPal, Skrill, Trustly, Zimpler, Paysafecard… If you are not sure which of these options you should use or how any of the methods work, you can find additional info under the FAQ section. The maximum deposit will depend on you since the casino members can adjust their own limits. 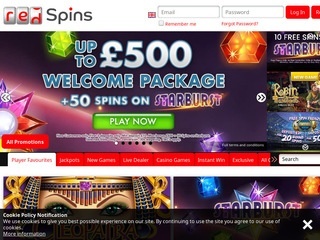 Red Spins casino allows one withdrawal per day – the minimum payout is £20 and the maximum is £2,000. The requested amount will be instantly removed from your balance, although the casino will take some time to process the withdrawal and approve it. In most cases, it will take around 3 days for the payout to be processed, whereas the settlement time depends on the selected method (0-5 business days). The casino provides email, phone, and Live Chat customer support. To talk to the casino representatives, you can give them a call on +44 203 621 6933 or use the Live Chat service between 8 am and midnight BST time. Alternatively, you can send an email to [email protected] or visit the casino’s FAQ section.